Strawberry Fields Forever Organic Playsuit comes in 0-3, 3-6, 6-12 and 12-18 month size. Such a darling playsuit! I chose the 3-6 month size just in hope that my daughter will be able to be in it longer. Can't wait for her arrival in November to try it out. I will most certainly post photos of her when she can wear it. 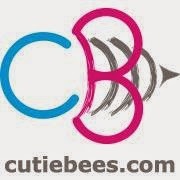 I am excited for Cutie Bees desire to provide healthy non toxic clothes for our most precious little ones! All of their products are made with organic cotton from non GMO cottonseeds. Never having any pesticides, herbicides or the like touching this beautiful cotton. Dyes are all non toxic and water based to continue to add gentleness to our babies skin. All clothing is free of formaldehyde, fire-retardants, chlorine, lead, and other petroleum based harsh toxic chemical used in conventional clothing manufacturing processes. Can we get any healthier for our children than Cutie Bees?? A baby's skin is more porous than an adults skin, allowing the dangerous chemicals found in clothing to more readily get through their skin and into their small bodies. Yuck!! Adorable pink strawberry on the tushie! When shopping with Cutie Bees you can choose from baby girl, baby boy and their neutral collection. There are still some mama's who enjoy keeping the little bundle a surprise till their birth, and you can surprise them with a gender neutral, healthy gift for their baby shower. As a Mom of 6, soon to be 7 I am very excited about the push to provide safe, eco friendly clothing for our children. They deserve the very best! Their product packaging is econ-friendly, made from recycled and recyclable materials. Clothing tags can be planted to grow flowers! I will definitely be saving my tag to plant! It will be the babies first mini flower garden. Cutie Bees giving project HOPE supports raising awareness on gender equality and women empowerment. In a partnership with “No More Tears”, a 501 (c) 3 not-for-profit providing home to victims of domestic violence in the U.S., Cutie Bees adds up the contributions made with each purchase in order to make a large difference. I love this. Organic baby clothing is so wonderful, I especially love to give as gifts. So nice to know that no harsh chemicals are used in the clothing process. I am also pleased to read about their giving program. I like to support companies that give back!